Charles Higa is shown in his garden studio with artwork for the "Commitment to Excellence" exhibit for which he is being honored. It's raining, it's pouring, the old man is ... painting? If that man is Hawaii artist Charles Higa, he certainly is, rain or shine. » Place: Academy Art Center, 1111 Victoria St.
Place: The Contemporary Museum at First Hawaiian Center, 999 Bishop St.
"Painting keeps me going," Higa says. "New ideas are always coming. The passion to create something new is within me." At 74, Higa usually enters just one art show a year -- to do more is tiring at his age, he says, and besides, it's time for younger people to make their mark. The show he does is his favorite -- the Honolulu Japanese Chamber of Commerce's "Commitment to Excellence." For several years, the watercolor painter and ceramist has been invited to be part of the juried show. But this year he's being honored for his career both as an artist and arts educator. For 42 years Higa also taught art to intermediate, high school and college students. The 29th annual exhibit opens today at the Academy Art Center and features the work of more than 50 artists, selected by jurors Wendy Kim Messier, Greg Northrop and Lisa Yoshihara, as well as pieces by 22 invited artists. It will showcase four recent watercolors and four ceramic pieces by Higa. "Because of the quality of this show, it keeps me on my toes to keep working," he says. "To show with others (feeds) that competitive spirit within me." Higa's time has been at a premium this year, thanks to the proverbial deluge of attention he's been receiving. In addition to "Commitment to Excellence," a retrospective of Higa's work is on display in the gallery of the Contemporary Museum's First Hawaiian Bank space downtown. 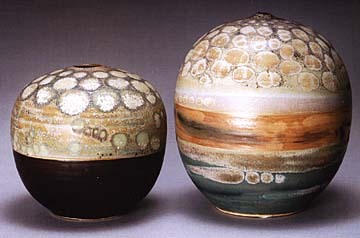 "Vessel," left, c. late 1950s glazed stoneware, and "Spots #2,"1973. "It sort of came as a surprise: two shows this year. I have to work hard," he says with delight. But all the to-do isn't surprising to others. Wayne Kawamoto, chairman of the chamber's art exhibition committee, says members didn't know about the museum show when they selected Higa for their tribute. "But everyone's having the same idea," he says of the desire to recognize the elders of the art community. "A couple of years ago, we honored Tadashi Sato. Last year it was Satoru Abe. When Tadashi passed away, we realized we need to do this regularly." Kawamoto calls Higa "very influential, not just for being a practicing artist, but for also being an educator. He's passed on some of his ideas and ideals, and his love for the arts. "It's a rounded human being we're trying to recognize." 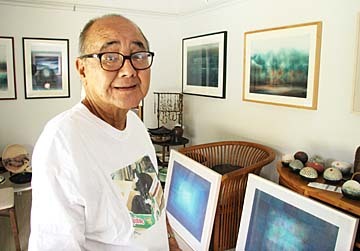 Charles E. Higa has been an artist for 50 years. For most of his 50 years as an artist, Charles Higa has juggled the cultivation of his artistic development with the demands of being an educator. Others have met with less success doing just one or the other, but Higa found a way to thrive within both worlds. The award-winning watercolor painter and ceramist does so by sticking to the basics. "What inspires me is my surroundings: the shapes, the space, the sizes, the colors, the lines, the darks and lights," he says, citing the rudiments of Art 101. "Everything has these six properties. When we're born, we can see color and it attracts us. Shapes are all around us. Sizes -- these things (draw the eye). It's very human." Knowledge of those six rudiments provides people with "a voice in expression," Higa says. Understanding the universal need for expression has fueled Higa's two successful careers. He's nurtured that voice in his students and continues to develop his own to this day. And so it is that to his list of recognition, national and international exhibitions and commissioned pieces seen throughout Honolulu, Higa adds a tribute at the Honolulu Japanese Chamber of Commerce's "Commitment to Excellence" exhibition. The exhibit of works by more than 70 artists opens today at the Academy Art Center and runs through Aug. 30. 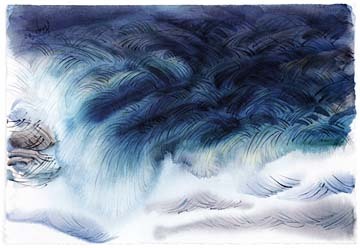 Higa has produced works such as "Windy Waves," 2000, a watercolor on paper. ANOTHER MAINSTAY of Higa's success is his commitment to painting every day. An autoimmune condition limits his ceramic work, but he still works on his watercolors faithfully. "When daylight comes I'm painting," he says. "And new things come about. "For this show I've worked on something different," he says of the eight pieces that are part of "Commitment to Excellence." "Although the subjects of some are reminiscent of my old work, the style and presentation are new. Change occurs as I go along." He takes his time on each piece. One might seem finished, "then I put it away, and then I go back to it. It takes months." Higa is even more meticulous when he selects pieces for exhibit. To start, he must have a good pool of paintings to choose from. Then there are the little touches he makes to each piece, and, finally, the framing that watercolor paintings require. "I'm very hard on myself when it comes to putting up something to show," says Higa. "It takes time." The years have clearly graced the artist with patience; it's a natural evolution, he says. "My early paintings were done very quickly, with the vigorousness of youth. Now, I'm older, more mature. I use critical thinking, I'm reflective. It's the same thing every artist goes through." That maturity has extended to the way Higa interacts with his medium. "One thing I discovered in watercolor painting is that the medium wants to do its own thing. It wants to blotch, it wants to run, it wants to fuse with other colors and I have to respect that," he says. "So I let it run and blotch, I let it do its own thing -- and I get some new ideas. "My work makes use of Western structure, which reflects my schooling, and the spirituality of the Orient, a tradition from growing up. It's a mixture of both. I strive for this." 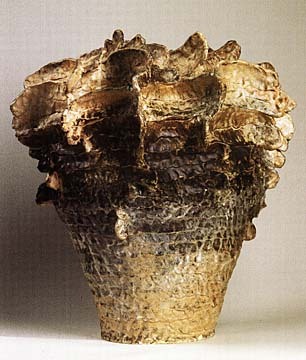 Among Higa's works is "Geode," 1970, glazed stoneware. HIGA WAS BORN (in 1933) and raised in Honolulu, one of 10 children. From the time he was a young boy, Higa enjoyed art. "I was always drawing, and I got scoldings for it in school," he recalls with a laugh. "In my tablet in the margins, while I was doing my lessons, I used to draw." Higa attended the Academy Art Center as a child and continued to develop his artistic bent in high school. At the University of Hawaii-Manoa, the artist started watercolor and earned an undergraduate art degree in 1955, studying with Jean Charlot and Sueko Kimura. In 1956 he earned a Master of Fine Arts degree from New York University. 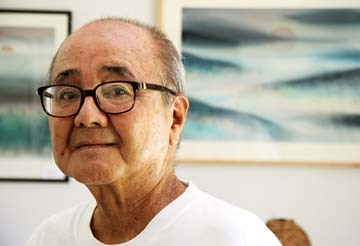 In the 1960s, Higa took up ceramics, earned a teaching certificate and began a career in the schools -- primarily 21 years at McKinley High School and 14 at Kapiolani Community College. "I really enjoyed working with young minds," he says. "One of the most exciting years was teaching seventh grade. The personality at that age is to be uninhibited -- they just came forth with ideas. By high school they're jaded and afraid to do things. And that's hard to overcome." Higa says many students came to him without the ability to draw, and understandably so. "Drawing and painting are very abstract things. It's difficult to understand the principles because we live in a 3-D world and they're drawing on a 2-D surface." He'd have his classes work with clay, a much more familiar medium for students with no art background -- "they could handle, feel and see" all the principles he was teaching. Another technique was to have students scribble "real fast" to help them overcome their fear. "They'd worry more about the time than what they had to draw," he says. Teaching definitely had its rewards for a man who was constantly evolving as an artist in his own right. "With all the ideas going on in the classroom, the students gave me ideas, too, and that made me a better artist," says Higa. "I saw 48 kids doing different things. I wouldn't be able to do all those things, but I was able to select what I wanted for myself. "I gave them projects, they gave me ideas." THE EDUCATIONAL SYSTEM could well address healthy expression in youth if it included art in its curriculum every year, Higa believes. Students would be well versed in the six rudiments, and by high school they would be much more comfortable in expressing themselves. Not to mention that they'd have an outlet much more appropriate than graffiti. "I've sort of given up, with all this pushing of math and science," Higa says with a sigh. "But art is needed; it's where creativity grows. "The nice thing about art is that there are no mistakes," he says. "I tell my old students, 'When you make a mistake, do it over again.' Keep making the mistake and it's not one anymore. "That's where new ideas begin."